"A child's work, is to create the man he will become. An adult works to perfect the environment but a child works to perfects himself." 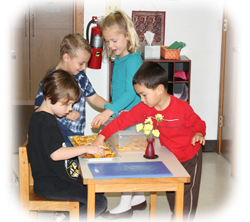 Using the child's natural inclinations as a point of departure, Dr. Montessori structured several exercises for the classroom to help the child satisfy this need for meaningful activity. For these exercises she used familiar objects--buttons, brushes, dishes, pitchers, water and many other things which the child recognized from his home experience. Several of the Practical Life Exercises involve the use of water with which most children naturally like to play. Carrying the water in the pitcher and pouring it into a basin helps the child to perfect his coordination. As he becomes absorbed in an activity such as scrubbing a table top, he gradually lengthens his span of concentration. He also learns to pay attention to details as he follows a regular sequence of actions. Finally, he learns good working habits as he finishes each task and puts away all his materials before beginning another activity. Although the Practical Life Exercises may seem simple and commonplace, they are actually a very important part of the Montessori program. Each of the tasks helps the child to perfect his coordination so that he will be able to work later with the more intricate academic materials. No learning takes place without concentration and attention. The child prepares to learn by performing exercises which help him to gradually lengthen the time in which he can focus his attention on a specific activity. The dressing frames are an important part of the Practical Life Exercises. Each frame isolates one skill of dressing and offers the child the opportunity to perfect this skill by repeating the motion over and over, thus helping her to become independent in dressing herself. There is one frame for each of the following: buttons, snaps, zipper, pins, buckles, laces, hooks and eyes, and bows to be tied. Since there are many opportunities for Practical Life Exercises in the home, parents should encourage each child in the skills of dressing herself as soon as she shows interest in the various operations. 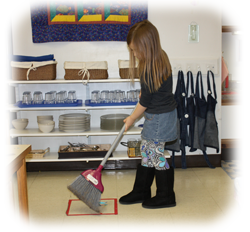 If the child wants to wash dishes, sort objects, polish silver, or pour milk, the parents should require same orderly procedure that is encouraged in the classroom so that good working habits may become second nature to the child.